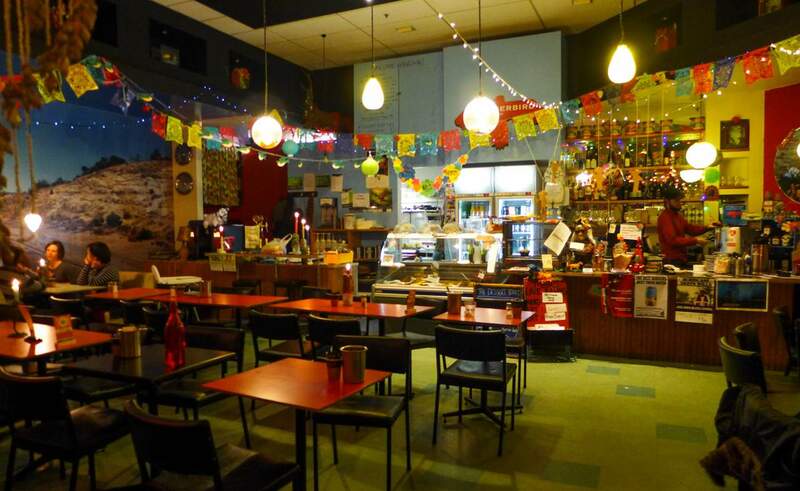 Great Mexican food, much like Wellington city, is a study of contrasts. Central American and Tex-Mex restaurants have been a local favourite since the early '90s and the hey day of the long defunct Mexican Cantina on Edward Street. Locals waxed fondly about that place for years. The city just loves Mexican food, and Mexican food loves us. Maybe it's because, much like the city itself, great Mexican cuisine is a study of contrasts. It's smokey chipotle heat cut with sweet mole and tangy limes; tender strips of meat and fish doused with sharp sauces, all ladled into willing mouths on crisp corn chips. We've come a long way since the old Mexican Cantina days. 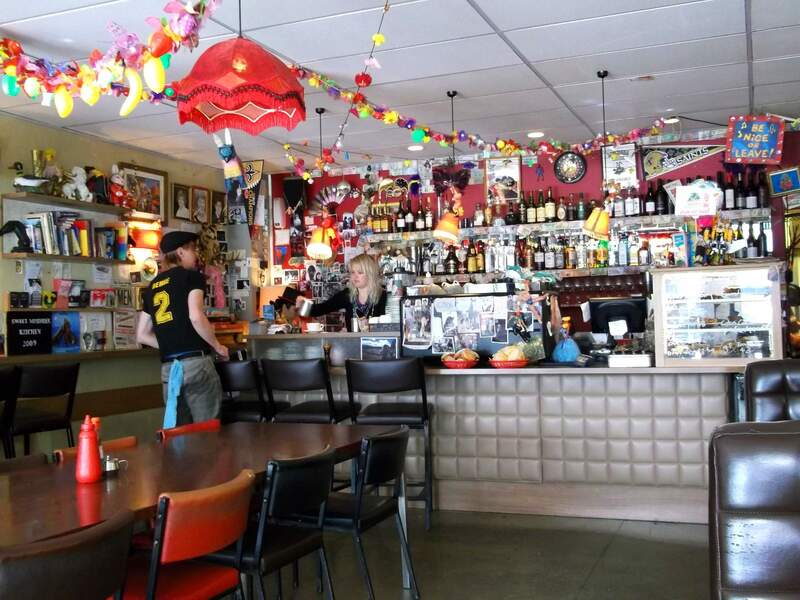 Nowadays, most Mexican restaurants in Wellington fuse together authentic South of the Border flavours with those in the South Pacific (and elsewhere) to create something uniquely Wellington. 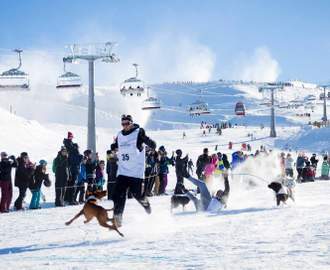 Below are eight of the finest in this category. At the risk of getting hyperbolic, Mexico has it all, from the spot on location on Dixon Street, to the great eclectic decor, to the great service and truly, truly great food. You can't really go wrong here. The decor's superb. 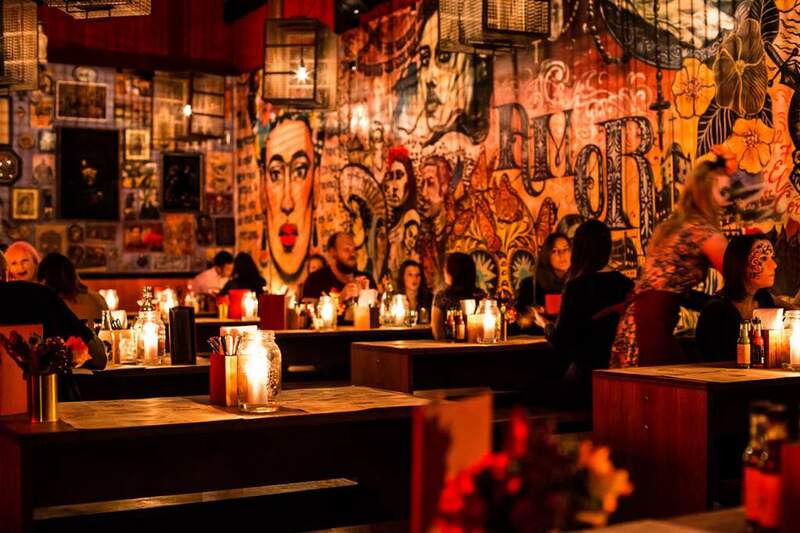 Eat on refectory-style tables overlooked by a forty-foot mural of all things Mexican - yes, Frida Kahlo is there, as are La Luchadores Fantastico. Meals are perfect little sharing plates, so you'd be wise to order widely and order lots of it. The brain baby of a New Orleans chef and a Wellingtonian, Sweet Mama's blends the best of US style food with Wellington wackiness - your table number is likely to come on the side of a plastic rhino, your server will be wearing a three wolf moon shirt, and your dinner will be tasty and hearty. Sweet Mama's is the best place to put yourself back together on a Sunday morning, although it isn't strictly Mex, nor is it Tex Mex. Sweet Mama's is more appropriately "Southern" style food, with plenty of Mexican elements. That means Louisiana po-boys sit next to prawn burritos and Southern fried crispy chicken on a menu as hearty and eclectic as the decor. However, they execute their Mexican meals so flawlessly, so we had to include them on the list. The moody restaurant's name is literally translated as 'death bread', but don't let the morbid name put you off, there's nothing deadly about Pan De Muerto, unless you're looking at the tequila selection. Pan De Muerto has the most extensive tequila menu in the capital with more than 30 brands on offer in a variety of styles. Pan De Muerto is a great piece of Central American diversification in the heart of Chinese Restaurant Land (we're looking at you, Tory Street). 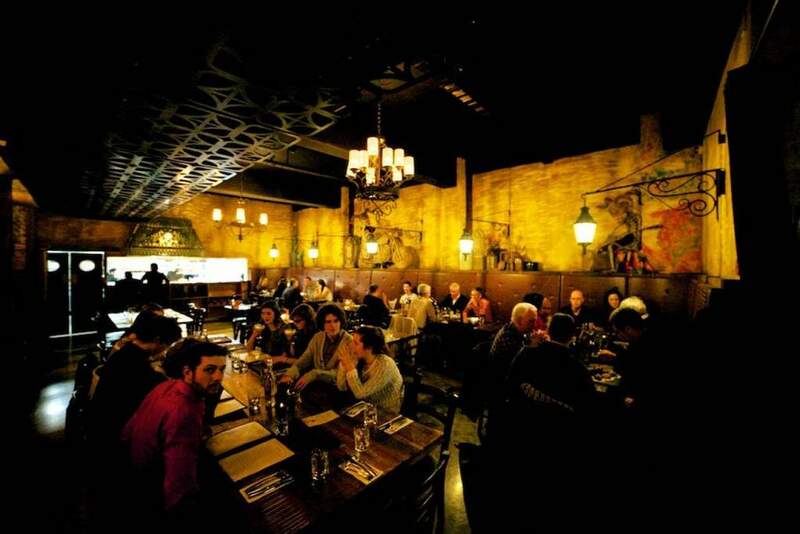 It offers Mexican fusion food, a menu that changes regularly depending on the season and a guaranteed great night. 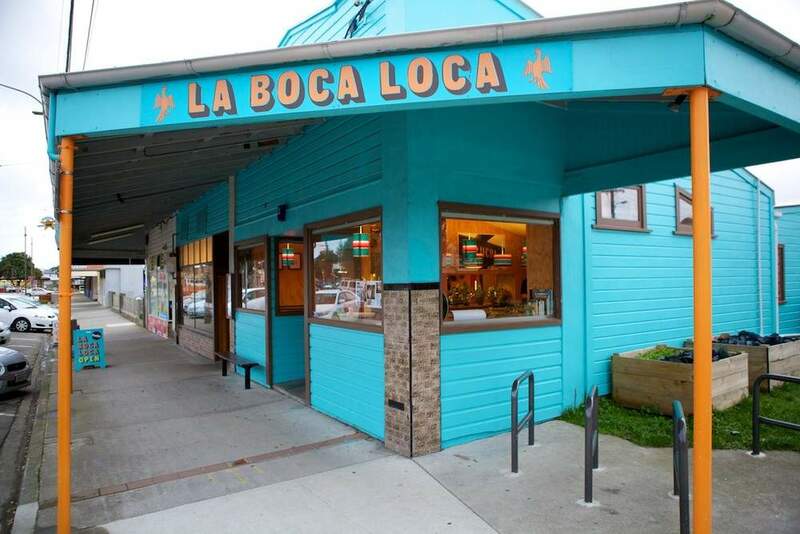 Fresh as a Baja breeze, La Boca Loca in Miramar is a bright, airy restaurant offering a delicate take on Mexican fusion food. With small portions and massive flavours, the taqueria is committed to fresh, organic produce with matches the stylish aesthetic. There's no Day of the Dead ephemera here, just long open tables, and the flutter of brightly coloured papel picado banners. It's a good match for the menu which favours soft tortillas made fresh each day, and daily sourced fillings of your choice. Pick your style - taco, burrito or quesadilla, choose your filling from a healthy list of local favourites, and enjoy. Styling itself a "Southern haven in the heart of the city", the Thunderbird has a funky eclectic vibe that feels a lot like Sweet Mother's Kitchen. In fact, the menu's are mirrors, with the addition of a much larger lunch and snack menu for those busy CBD go-getters. If you've worked up a healthy appetite from all the corporate takeovers and wheeler-dealing you've been doing, there's also a lunch deal - burrito and beer for $22; now that's hard to beat. For the post work come down, Thunderbird is licensed - the usual suspects in the beer and wine department - and hosts live music on Thursday, Friday and Saturday nights. Thunderbird's real point of difference is that it is intrinsically different, funkier and more fun than anything else within a four block radius. That and the Baja prawn quesadilla, which is heaven in a tin dish. The fact Viva Mexico has two restaurants in the city, one on the Left Bank and one in Newtown (we sampled the delights of the original Left Bank restaurant), goes to show just how popular Mexican food is right now in the Capital. Viva Mexico in Newtown is always packed, often with folks waiting outside on the handy benches. That's probably down to the fact food doesn't get much more Mexican than Viva Mexico's food. From the ensalada that looks like a brightly coloured fiesta hat, to the fiery huevos azteca, there's no fusion going on here. This is straight up, down home, no-joke authentic Mexicana. The beans are black as pitch, the mole sauce is chocolatey and the salsa is as picante as it can get. 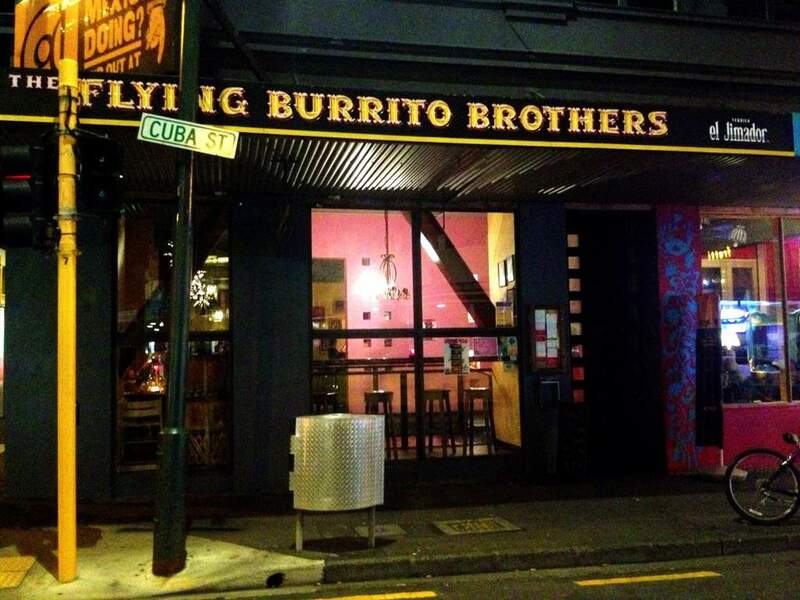 One of the longest running Mexican restaurant's in the Capital, Flying Burrito Brothers on the corner of Vivian and Cuba Sts is a Wellington Institution. It's where you go to bust your Tequila Slammer cherry on your 21st, or where you take friends to show them a raucous good time. 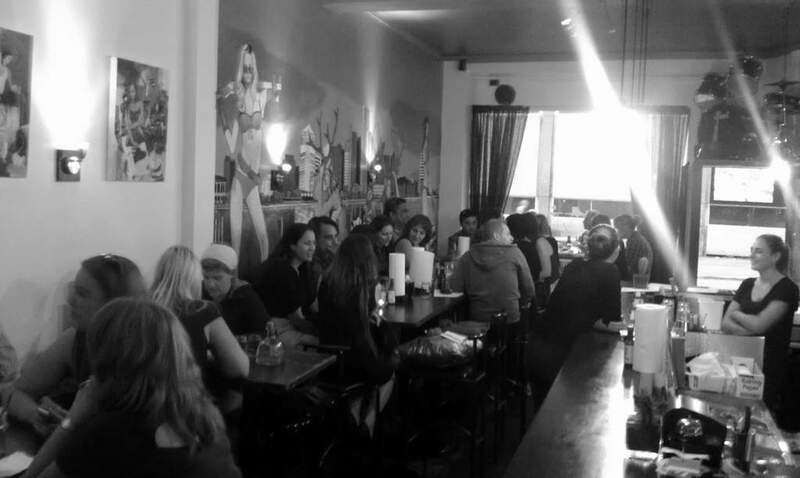 The first of what is now a chain - there are FBBs in Auckland and Hamilton now - Wellington's branch has had some ups and downs in the fast paced Wellington dining world. The Brothers have taken flight once more, however, born away on the current passion for all things South of the Border. They have a huge, detailed menu taking in all the Mexican hits, with a few specialities of their own. TJ's serves Mexican they way Kiwi's used to like it - in huge, flavourful portions and with a large helping or Americana on the side. There's no burrito on the menu, but they do have massive servings of nachos heaped with ground beef chilli and lashings of cheese - named, strangely enough, after San Francisco 49's player, Joe Staley - and the now ubiquitous taco plates. There's a selection of "wee plates" to share while watching the game on the massive TV behind the bar and the atmosphere can be quite raucous when the narrow restaurant gets full. Let's face it, though, what you've shlepped all the way up Tory Street for are the Real Buffalo Wings. No measly pile of wicked wings, these bad boys are tender chunks of finger licking goodness, authentically prepared with your choice of seasonings, and at your level of spice - medium, hot, and damn hot. They also come with the US standard celery sticks - to cut through the heat - and ranch dressing. They're not cheap, but if you're looking for a fun meal to share with with mates, this is it.